Blooming with sweet sentiments and endearing charm to get you to look your bridal best on your wedding day. Stunning cream roses, pink mini carnations, pink alstroemeria, pink double lisianthus, blue hydrangea and bupleurum are brought together to create a picture-perfect bouquet. 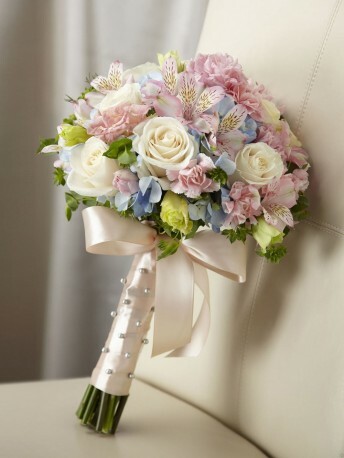 Tied together with a soft peach satin ribbon accented with pixie pearl pins, this incredible styling culminates in a bow at the base of the bouquet. Approx. 16"H x 12"W.